Unlike many textured scenic materials, 90% Polyester 10% Spandex Spider Stretch is a true fabric. 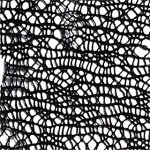 It is woven in a pattern that appears random, making it ideal for lighting and shadow effects. True fabric is right! This material sews well even with the random pattern. Our new facility just outside Chicago will be show casing the along with other inspirational fabrics in the form of office dividers, interaction areas & ceiling canopy panels.